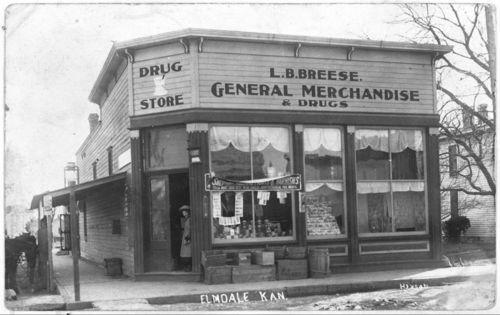 These two photographs show exterior views of the L. B. Breese General Merchandise and Drug Store in Elmdale, Kansas. One photograph shows a woman standing in the doorway of the store, and some items are visible in the window displays of the store. A horse is visible on the left of the picture, while a street lamp is visible near the corner of the block. The other photograph shows a few adults, including L. B. Breese, and a few children standing near the doorway of the store, and items in the window displays are partially visible. Both pictures show the traditional mortar and pestle pharmacy symbol on the "Drug Store" sign over the door on the corner of the building.